Cell owners feel safer, but disrupted by the mobile phone. With more than 4 in 5 American adults in possession of a cell phone, how do users feel about their handsets? 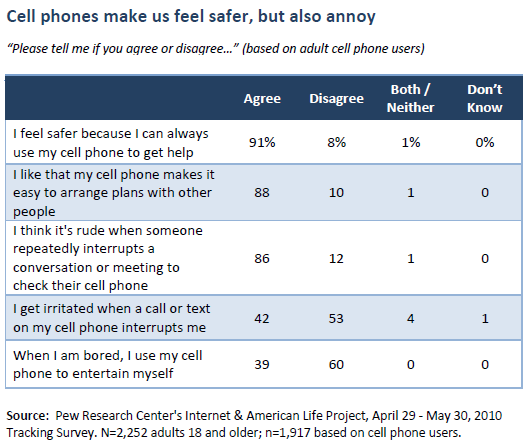 Overall, nearly every adult with a cell phone feels safer because of the device; 91% of cell phone users agree that their phone makes them feel safer because they can always use it to get help. Women are more likely to say they feel safer because of their cell phone than men. Nearly nine in ten cell phone users (88%) also believe that the phone makes it easier to arrange plans with other people, corroborated by the findings detailed earlier in this report that adults with cell phones are very likely to use voice and text to coordinate meeting in person and to check in with others. Heavy text and cell voice users (more than 50 texts or more than 30 calls per day) are more likely to agree that their cell phone makes it easy to arrange plans with others. Similarly, parents and adults with a college education or greater are more likely to agree that they appreciate the ability to check in and arrange plans that their cell phone offers. But users still experience substantial frustrations around the incoming contacts they receive as well as others’ use of the cell phone. Another 86% of cell phone users agree that it is rude when someone repeatedly interrupts a conversation or meeting to check their cell phone, and two in five cell owners say they’re irritated when a call or text interrupts them. Women and white cell phone owners and those with higher incomes and education are more likely to say it’s rude to interrupt a face-to-face conversation to repeatedly check your phone, while English-speaking Hispanics are more likely than white phone owners to report irritation when a message or text on their phone interrupts them. The very youngest adult users (ages 18-24) are more likely than those 25-29 to say they find a call or text that interrupts them irritating – possibly because a larger percentage of this age group sends and receives a very large quantity – upwards of 200 — text messages a day. However, there are no significant differences between heavy and light texters overall in their likelihood of expressing irritation with cell phone interruptions, and heavy voice callers are more likely to say that they disagree that cell phone interruptions are irritating. Still, it may be that young adults are less inured to the cellphone’s disruptive capabilities. Unlike cell phone users under 18, adults as a group are not particularly likely to use the cell phone to amuse themselves when they are bored –39% of adults say they fight boredom with their phone, while nearly seven in ten teens say the same. Young adults show a similar pattern to teens – 72% of 18-29 year olds use their phones to beat boredom. Low income users are also more likely to use their phone to fight boredom, with 50% of those earning less than $30,000 annually saying they use the phone for that purpose. Black and Hispanic cell owners, and parents with cell phones are also more likely to say they use the phone to keep themselves amused. Heavy cell phone users (those who text 50 or more messages a day, make or receive more than 30 calls or access the internet through their phone daily) are more likely than their less enthusiastic counterparts to agree that they use their phones to combat boredom. Those with wireless internet access and broadband at home as well as those who live in urban areas are all more likely to use the phone to stave off boredom.